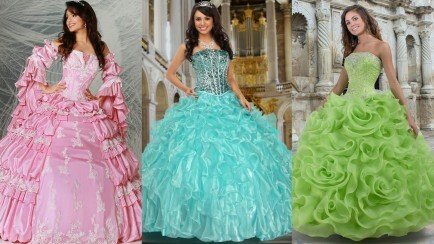 We have so many beautiful modest Quinceanera dresses this year, we couldn’t show them all to you in one group! 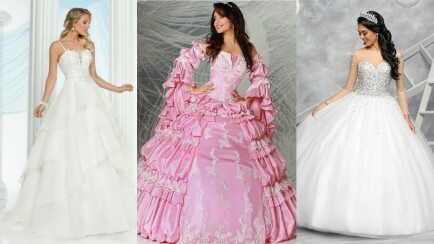 So here are 9 more styles—halter, sweet straps, and strpless gowns with illusion bodices for style with less hassle. And just as with all of our dresses, choosing a Q by DaVinci dress guarantees you’ll get top quality fabrics, high-end construction, budget-friendly prices and super-fast shipping times! And if you missed Part One, click here then come back! 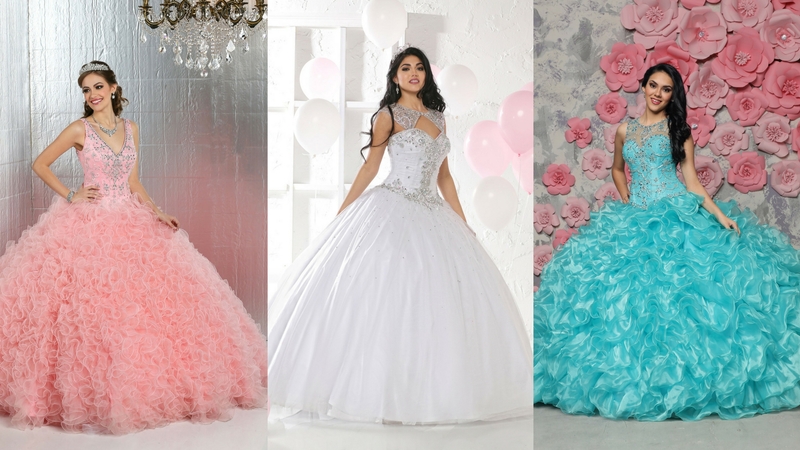 Each of our dress designs comes in any number of colors—too many colors for us to list here! 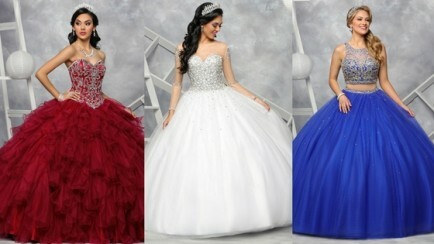 But it’s easy to choose the color you want for the dress you love best. Just call or visit your nearest Q by DaVinci retailer and ask to see swatches. Diagonal ruching on the bodice and lush crystal beading make this one piece organza and tulle gown a standout. Wide illusion straps add a modest touch to the classic sweetheart neckline and lead to a full illusion back with a hidden zipper. The skirt is gathered into loose rosettes starting at the waist and then finishes in ruffled layers at the hemline. Perhaps most dramatic is the crystal beading that lines the bodice, follows the diagonal ruching to the dropped waistline, and encrusts the straps and shoulders to create a stunning back detail. Layers of fluffy tulle and a beaded satin bodice make this one piece dress lovely and comfortable. The scoop neck illusion bodice creates a modest silhouette over the satin sweetheart bodice, and the back is full illusion for more modest coverage. Beads and sequins placed in a delicate swirl pattern adorn the entire bodice all around, while a line of covered buttons trails up the back to finish the look. One look at the unique ombre detail on the skirt, and you’ll fall in love with this one piece organza and tulle confection! The classic sweetheart neckline is softened by modest illusion straps that lead to a full illusion back. The skirt alternates swirls of ombre ruffles and precisely placed rosettes at the hips with ruffled streamers cascading down the smooth skirt to the hemline. Delicate crystal and sequin beading zigzag down the lines of the bodice, delicately grace the illusion shoulder straps and follow down the hidden zipper to the low V-back. This one piece corset back sweetheart neckline dress combines a strapless look with beaded illusion to create a modest collar effect in front and wide tapering straps in back. 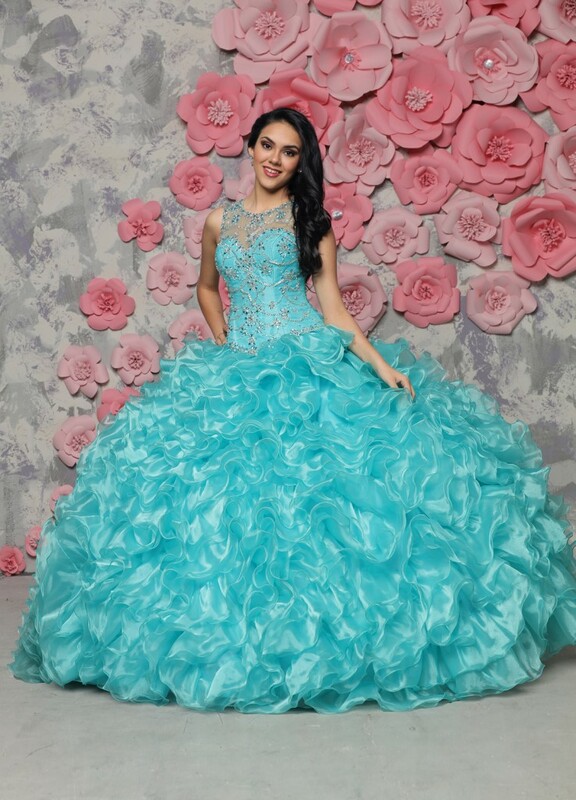 The bodice and illusion straps are embellished with crystals, sequins and beading in swirls across the shoulders, down the front and then follow the neckline and waist. Sequins scattered across the tulle skirt complete this glittering design. Tight coils of ruffled tulle in the skirt and a heart-shaped open back detail make this dress a showstopper. From the front, the classic V-neckline features a delicate filigree of beading, crystals, and sequins with modestly wide straps, edged in beading all along the neckline, that meet in back and then form the heart shape. One piece with a hidden zipper, this gown is available with a charming ruffled sleeve tulle jacket. From the delicate detail of the high neck illusion bodice over a sweetheart style neckline, to the skirt fashioned with layer upon layer of tightly ruffled organza, this two piece dress is a classic. 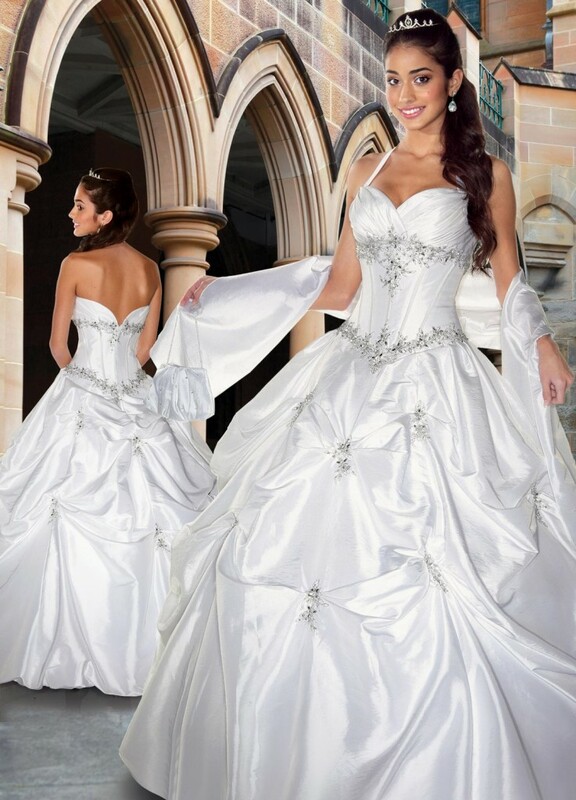 The main bodice is embellished with garlands of beading and features a comfortable corset back. A beaded illusion overlay creates a modest, high scoop neckline in front that splits into straps for a charming open back detail, and a matching organza jacket is available to complete this demure look. This stunning modest two piece dress features a full coverage halter style illusion bodice over a sweetheart neckline. The bodice has a corset back, is fully beaded and embroidered, and features a cascade necklace effect at the high neckline. The unique illusion back detail creates a strand of jewels effect. The skirt is gently layered with softly feathered tulle from waist to hem. 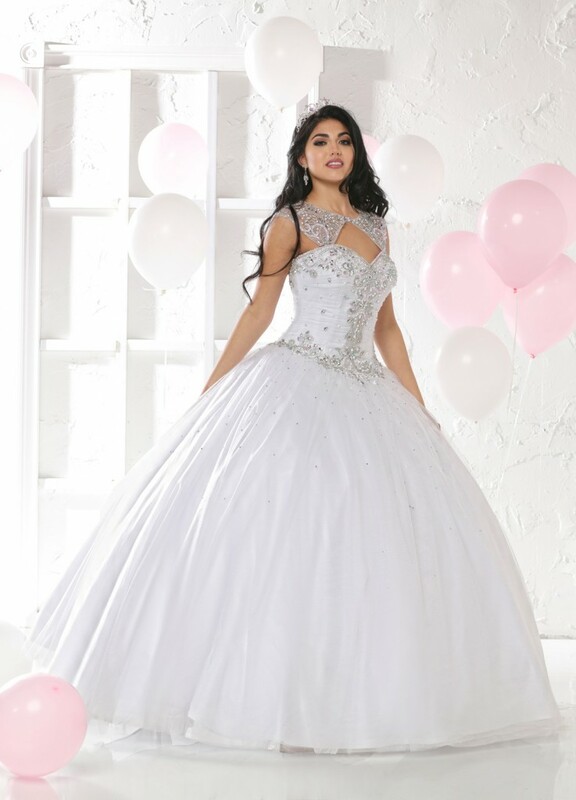 A beautiful gown shown in classic Quinceanera white, this one piece halter dress features a ruched sweetheart neckline in strapless style but with delicate straps for modest security. The bodice is embellished with beading and sequin accent under the empire style bustline then again at the dropped waist. A demurely rounded V-back, also encrusted with beads and sequins, has a hidden zipper for ease. The classic taffeta skirt is adorned with crystal and bead accents at each pickup. Complete the look with a matching taffeta shawl. This one piece corset back dress features a full coverage front bodice over a sweetheart neckline. Back detail includes illusion straps with a line of beading and crystals along the entire neckline. The bodice is embroidered with an open work design of jewels and sequins, and the ballroom skirt of glitter tulle lies in smoothly gathered layers from waist to hem. 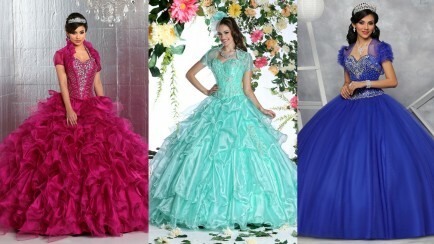 Did you find your perfect dress in this collection? Then click here, enter your city, state, or zip code, and find the Q by DaVinci retailer nearest you to order the dress in your favorite color!